Eagles quarterbacks Carson Wentz (11) and Nick Foles (9) throwing passes during practice in May. The Eagles seem confident they can avoid missteps in the weeks ahead, while handling a situation no NFL team has ever handled, or had the opportunity to handle. They will take the training-camp field July 26 with the reigning Super Bowl MVP as their starting quarterback. Watching and working in, as he returns from knee surgery, is the quarterback who very likely would have been the league's regular-season MVP if he hadn't torn two ligaments in his left knee on Dec. 10 against the Rams. We've heard a lot since that December day about the relationship between Nick Foles and Carson Wentz, how there was no hint of clashing agendas or hurt feelings as Foles took the helm and somehow, against all odds, became what Wentz was brought here to be: the quarterback who ended the franchise's 57-year title drought. Now, though, we're starting another chapter, equally uncharted. Or maybe more uncharted. En route to the Super Bowl, as unusual as the situation was, the lines were clear — Foles was in charge of the offense, and Wentz was a spectator who offered suggestions and acted as a sounding board. But when camp starts, Wentz will be there on the field as well, gradually increasing his workload, inching toward his stated goal of taking the job back in time for the Sept. 6 season opener against Atlanta. "Come camp, I'll just keep progressing, doing more and more," Wentz predicted last month. While he acknowledges the need not to push or rush anything, Wentz is clearly impatient; he noted during minicamp that he had "never dealt with an injury [that required] more than two months before." It seems likely that Foles will be the No. 1 QB through the preseason. If he plays the way he played in the NFC championship game and the Super Bowl (54-for-76, 725 yards, six touchdowns, one interception), will that build any momentum toward Doug Pederson being extra, extra careful with Wentz and entering the season with Foles under center? There is plenty of opportunity for awkwardness, maybe even confusion. But, so far, every attempt to pry open a fissure has been met with calm assurance that there will be no cracks in the organizational facade, no dissonance. "You sort of put your ego to the side, and you want what's best for the team," Foles said last month. "Ultimately, Carson's getting ready to play; he's getting healthy. But, at the same time, I'm ready to go out there and play. I'm equipped. I think I've shown that. "But it takes more than one person to make a team. I think that's what's beautiful about this team. I think that's what this team showed last year. It's not one person — it's the entire group. … Everyone puts their egos to the side when they walk in this building. They're all working for the Philadelphia Eagles. I think that's why we have something so special here." “You sort of put your ego to the side, and you want what’s best for the team,” Nick Foles says. Wentz said that even with both "starting quarterbacks" on the field, nothing really changes. "Guys know the vibe on the team. Nothing really changed" with Foles in charge, Wentz said. "It allows us to mesh so well. Neither of us is really forcing anything. It's just really natural." Nobody in the locker room seems concerned about which voice to listen to, which leader to follow. "Whoever is out there [with the starters], that's the leader of the team. That's the guy," right guard Brandon Brooks said. "They're both, when they're in … going to be the leader," center Jason Kelce said. "They both lead in their own unique ways. … Both of those guys have their own feel. The good thing for us is, we're familiar with both of them. We have a lot of confidence in both of those guys. We're in a very, very fortunate situation here." Tight end Zach Ertz said that regardless of who breaks the huddle, "there's no question who the leader of this team is. You ask anyone; Carson's the leader of this team. When he went down, everyone kind of raised their own level of leadership. When Carson comes back, I think everyone kind of defers to him." As for what he expects on Sept. 6, Ertz said, "As a competitor, I cannot see [Wentz] not out there, but, at the same time, I can see Nick starting for us. Nick is a great quarterback. He is definitely a top-30 quarterback in this league, no doubt about it." >>READ MORE: Is Ben McAdoo right about the Eagles' inability to handle success? 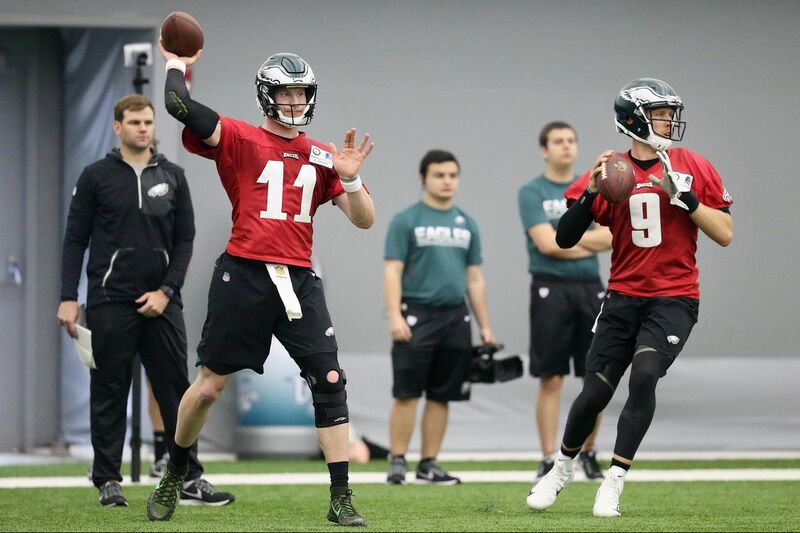 Pederson hasn't tied himself to Wentz's desired time line, but with the third-year QB getting a taste of seven-on-seven work during the final minicamp in June, there is little reason to quibble with Wentz's optimism. "I'm not going to put myself in a box that way. I'm just going to see how it unfolds, quite honestly," Pederson said as the Eagles wrapped up spring work. Pederson mentioned that he prepared two starting quarterbacks two years ago, when Sam Bradford was the starter in camp, but everyone knew Wentz, the rookie the Eagles had traded up to draft second overall, was the future of the franchise. "For me, it's going to be about communication with both of them," Pederson said. "Go back to my first year, when we were trying to get all three guys [including backup Chase Daniel] an equal amount of reps going through the first couple of weeks of training camp. It's going to be maybe the same type of thing, where [both] Nick and Carson are working with the ones, working with the starters. "But at the same time … it's on the players sometimes to work a little extra outside the confines of practice to make sure they're getting the proper reps they need, the proper throws that they need to work with guys like Mike [Wallace, the wideout added in free agency]. … It can be a challenge, but I'm definitely not going to worry too much about it as we go. It's still a long time before we play." Carson Wentz aims to start in the season opener Sept. 6 vs. Atlanta. Foles might be the only quarterback in pro football whose ego is elastic enough to accommodate what he is being asked to do. There is no way, unless Wentz suffers further injury, that Foles will become the long-term starter here, and he knows that. Foles also knows that if the start of camp is going to be a little like the 2016 Bradford-Wentz dynamic, the ending could also be like that. If Wentz shows he can be ready Week 1, and a team that thinks it will have something to play for suddenly needs a starting QB, Foles could still be traded. Head of football operations Howie Roseman would rather get something for him than just wave goodbye in free agency after the season. "I'm open to it. I'm basically here on a one-year deal, with a player option for ," Foles said about a possible trade in a Sports Illustrated video interview. The Eagles reworked Foles' contract to give him the chance to make starter's money if he plays a lot. "I'd play my whole career in Philadelphia if I could. … I'd love to be in Philadelphia this year and then be a free agent, to sit down with my wife and say, 'Hey, what is best for our family?' "
One reason that the transition from Wentz to Foles worked last season, and that transitioning back to Wentz might also be seamless, is that their egos seem to complement, rather than clash. "They're extremely different people, and I think that's what makes it work," Ertz said. "Carson's obviously that alpha personality. He's the guy that's the vocal leader; he's going to call you out if you're doing things wrong. Whereas Nick … he wants to feel things out; he's going to lead by example, kind of." Ertz said that Foles' wanting to stay after winning the Super Bowl is an example of his extraordinarily selfless personality. "He didn't have to sign that [reworked deal]. He could have demanded a trade after the Super Bowl," Ertz said. "But … he wanted to come back and be with his boys. He's had great experiences here." Ertz said the scene on the U.S. Bank Stadium stage after Super Bowl showed that Wentz, while being more vocal than Foles, also is selfless. "Carson had every right, as a human, to be like, 'Man, I wish I was up there.' Jealousy or envy could have been in his heart, but that couldn't be further from where he was at that moment," Ertz said. "He was just up there trying to celebrate with his team, and Nick in particular." Foles said his relationship with Wentz is uncomplicated. They probably won't spend a lot of time in camp talking about who is getting more practice reps and the transfer of leadership. "I think everyone thinks we get together, and we have these really deep conversations and sort of reminisce," Foles said. "I think we sort of look at each other, laugh, smile. And go about our business. We're just guys."